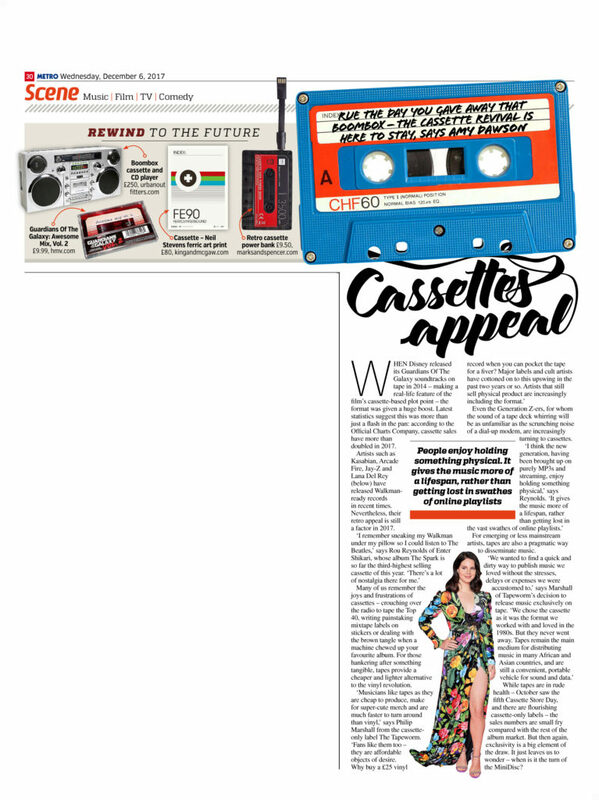 Rue the day you gave away that boombox – the cassette revival is here to say, says Amy Dawson. When Disney released its Guardians Of The Galaxy soundtracks on tape in 2014 – making a real-life feature of the film’s cassette-based plot point – the format was given a huge boost. Latest statistics suggest this was more than just a flash in the pan: according to the Official Charts Company, cassette sales have more than doubled in 2017. Many of us remember the joys and frustrations of cassettes – crouching over the radio to tape the Top 40, writing painstaking mixtape labels on stickers or dealing with the brown tangle when a machine chewed up your favourite album. For those hankering after something tangible, tapes provide a cheaper and lighter alternative to the vinyl revolution. While tapes are in rude health – October saw the fifth Cassette Store Day, and there are flourishing cassette-only labels – the sales numbers are small fry compared with the rest of the album market. But then again, exclusivity is a big element of the draw. It just leaves us to wonder – when is it the turn of the MiniDisc?